Looking for healthy Thanksgiving recipes? You'll love this easy recipe for garlicky roasted potatoes. 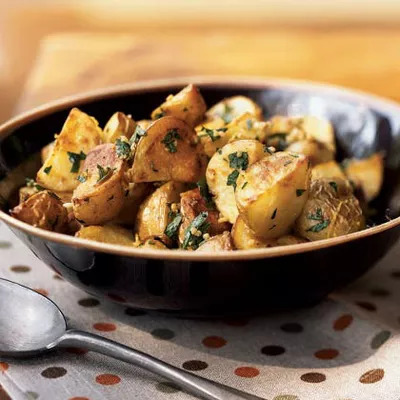 It combines simple ingredients like fresh herbs, lemon zest, garlic, olive oil, and your favorite variety of spud, to create a dish that's low in saturated fat and only 195 calories per serving. If you don't associate the word "healthy" with potatoes, don't blame the humble tuber. All too often we eat our potatoes fried, or smothered with butter and cream. On their own, they make a healthy meal that's rich in vitamin C, phytochemicals and nutrients, and fiber. In general, you can't go wrong if you stick with Mediterranean diet-like ingredients, like olive oil, garlic, and fresh herbs, when making any vegetable dish. Plus this recipe is easy to make, leaving you to concentrate your efforts on roasting the turkey or creating a fancy dessert. You just cook the garlic and oil in a small saucepan for 2 minutes. Remove the garlic with a slotted spoon and set aside. Drizzle the oil over the potatoes and arrange them in a single layer on a baking sheet coated with cooking spray. Sprinkle with salt and pepper, and bake at 475° for 30 minutes. Combine the garlic, parsley, and lemon rind in a small bowl, then sprinkle the mixture over the potatoes.